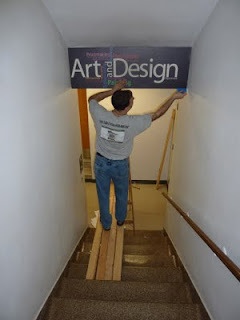 The sign welcoming visitors to the art department was installed just in time for the start of the new academic year. Thanks go out to Rich Hultman (class of 1986) of Big Guy Creative Studios for making 'real' Liz Dougherty's design contest winner. He is pictured here installing the work. Stop in soon and see it for yourself!